A great exercise for ball control and fitness together. Start by having players in groups of two, with a server having the ball and a player 7 yards away. - This fitness and ball control is set up with players in groups of 2, with player A as the server with a ball. - Player B is behind a cone, the cone being 5 yards from the server. 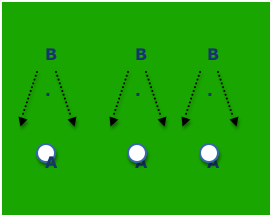 - Player B works for 45-60 seconds then switch roles. - Player B makes a short, quick sprint to the right of the cone, player A passes a ball to the outside (right) foot of player B who takes 1 touch to pass back. - Player B then runs backwards around the cone and sprints forward on the left side for a 1 touch pass, and repeat until time expires. - Server should always be on their toes, never "flat footed." - Passes should be made to outside foot, which typically would be furthest from an oncoming defender to best protect the ball. - All passes should be crisp and accurate along the ground. - Players should get in the habit of calling for every pass. - The run backwards/forwards should be approximately 5-7 yards, short, quick steps is the ideal footwork. - Passes should be made with body in good balance. - Receiver must take 2 touches. - Serve ball in air for a side footed volley back to servers hands. - Serve ball to thigh, control and pass along ground. - Serve ball to chest, control and pass along ground. - 7-10 minutes for ball controll practice.